Custom wood fences are a great residential fence option to consider. Not only do they add privacy and act as a safe enclosure for your pets and children, but they also add great value to your Manassas home. One may become overwhelmed with the types of residential fence options. As research indicates, custom wood fences stack against the rest when it comes to popularity, sturdiness and appearance. There are many different custom wood fence styles and designs. Wood fences come in all shapes and sizes and to name just a few popular options, there is solid board fencing, lattice top fencing and stockade fencing. It is important when contemplating a custom wood fence, to take into consideration the exterior of your home and size of your property. Certain custom wood fence styles may not complement the style of your home, such as a picket fence may not look appropriate surrounding a mansion while a stockade fence may not add any curb appeal to a cottage home. Additionally, the size of the yard surrounding your Manassas home is important to consider. While custom wood fences are generally affordable, the cost of materials will add up if your yard is very large. 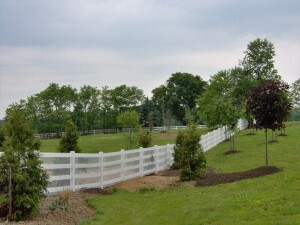 Remember, whatever custom wood fence option you choose, a custom wood fence adds to your Manassas home’s market value. Many times, homebuyers are drawn towards homes that have existing custom wood fences because the buyers may have pets or children which they wish to keep safe and secure. If the fence is already part of the package, they are more likely to purchase the home and pay top dollar. But, it is important to keep the fence in good condition which is not difficult with a custom wood fence because they are durable and withstand nature’s elements relatively well. Ready to get the fence of your dreams? This entry was posted on Monday, October 26th, 2015 at 9:38 pm. Both comments and pings are currently closed.